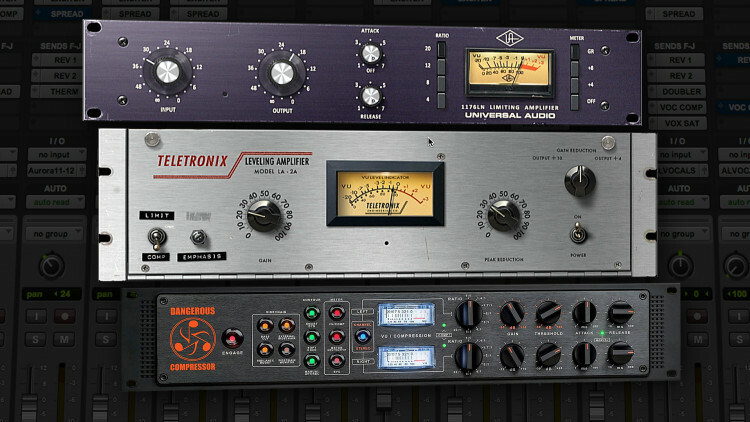 Are you tired of singers who want you to keep adding more compression to their vocals? Did you (or your client) hear a nasty rumor that ALL vocals are supposed to be slamming the meter on the compressor? Rather than trying to accomplish all your “squishing” with just one compressor Fab Dupont shows you how to use multiple compressors, in a more civilized manner, to get a great compressed tone and level without such a smothered sound. From peak limiting to gently compressing, Fab goes deep into the art of compression. 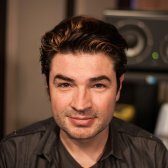 He shows you how to compress vocals using both the classic holy chain of vocal compression (1176 into a LA-2A) and a powerful modern day compressor (the Dangerous Music Compressor). Then Fab follows his ear and turns a compressor into a de-esser using the compressor's sidechain input. Today we're going to talk about advanced vocal compression. Uh la la! We're not gonna try and advance the cause of compression. It seems to advance it's own cause very well by itself. What we're gonna do is advance our cause in the realm of compression. You might find yourself in the middle of a mix, when and unscrupulous artist, probably a singer will push you to over compress their vocal. What does one do? Does on react, push back, scream, form a union, give up? No. One does like the bamboo, pushes back gently but sways with the wind. Let me show you. Here's a vocal, uncompressed, by the amazing Will Knox. The number one vocal compressor in the history of the universe is the 1176. Here's a fantastic rendition by Universal Audio. So, let's over compress it. Let's over compress it more. And with a lot of compression from the 1176. There's a smothered quality to it. Listen to the first phrase, the thickness of it, and the last phrase. So it's compressed, and it's there. But it doesn't have any texture. And my attack is not even at the fastest setting. I see a lot of people compressing vocals this way. So if you open it like this, you get a little bit of presence. But then it creates artifacts. As a reminder, the clean version is like this. See that presence, that texture? That's all gone. So, you can compress the hell out of this and get a steady level. But it doesn't have the same feeling. Other people use an LA-2 instead. It sounds like this. Obviously it's too loud and doesn't compress enough let's compress for real. So the warmth is interesting but all those artifacts and the attacks are not interesting and this thing is stuck with one attack. Well, over the years people have tended to over compress the hell out of their vocal with an 1176. Flatten it like a pancake, put it out and move on to the next record. But we're not that kind of people. what if we combined both?" The flattening capability of the 1176 and the warm fuzzy feeling of the LA-2. So here I have an 1176 that I set up as a peak limiter. The attack is very fast, if you remember, 7 is fast on an 1176. The release is fast. And the ratio is at 20:1 which means all those peaks are gonna get slapped really quickly. And I'm just gonna do a little bit of slapping like this. Notice that we gain a little bit of body. Why is that? Because at the same level, the peaks are tucked in and I'm able to push it in a little bit. And I'm attempting to listen to both more or less at the same level. So that's a good first step, but it still kind of hovers a little bit. So let's put a LA-2 after, in series, right after the 1176. I'll play it again with just the 1176 in peak control mode than 1176 and LA-2. So we get the peak control and we get this body, the steadiness from the LA-2 on top of the 1176. This is great, let's listen to the raw versus both in a row. Listen to the space in between the word, the steadiness of the whole phrase and the consistency from phrase to phrase. You get the steadiness, you get the peak control but you get color too. Even if you compress a little bit less here on the LA-2 you're still gonna get color. That's very useful and it does the trick. But this is how people have been doing this for years on pop records. If you have a transparent compressor you can do the same thing without the color, let me show you. For this purpose I'm gonna use a Dangerous compressor, which is a piece of hardware that I love dearly, and for disclosure, I had a hand in designing it, so it does exactly what I want it to do. So I inserted my Dangerous compressor onto my vocal, using a Pro Tools Insert I/O thing. And what I did is I ran a vocal first to the top compressor, which I'll use as my limiter, and then, back in the same box, to the bottom compressor. Because this is a dual mono or stereo compressor I'm gonna use it in dual mono. So the top will be my limiter, replacing my 1176, and the bottom will be my compressor replacing the LA-2. The difference is that this is a very transparent compressor so I should be able to do the exact same trick, get the same control, but not get the color. So, let's just set up the limiter. Like this. And I'm gonna leave the compressor on 1:1 ratio with no gain. That way, I don't have to hear what the bottom does. Comp LED when this comes on, the detector is being triggered, so you know when it sees level that concerns it. So I'm gonna let it go. It gets a little steadier, right? I'll play it again without. I should give it a tiny bit of gain. So there is absolutely no difference in color because it's transparent but you get that steadiness going on. So now let's set up the bottom. I'm gonna add some gain to compensate for the loss of gain from the compression. Right? Without. I could compress a little more. Listen to the texture of the vocal without compression. Check it out. Amazing presence, right? It's right there but there's no color. It would be interesting to compare the hardware and the software, not in a competition spirit but just to see the difference between a colored path and a clean path. For example, this is the Dangerous we just heard. And this is the two old school compressors in a row. Interesting, isn't it? The Dangerous was a little softer so I'm gonna raise the level a little. Check it out. This is the vintage. Interestingly enough, in this case, the modern device is fatter and steadier than the combination of the two old school devices, which is probably counterintuitive and contrary to whatever you read online. Listening to this makes me wanna show you another interesting advanced compression trick. The main problem is the S.
The Ss are so loud they are disconnected from the actual body of the sound. It's S and it's band. And it's gonna be a problem in the mix. It's already a problem in compressing so I can't even imagine when I start Eqing to match with other bright stuff. So what I'm gonna do is set up this compressor as a super nuclear de-esser to get rid of those Ss. Let me show you. This compressor has and external side-chain function. So I duplicated my vocal track, I called it side-chain. I put an EQ on it, I'll tell you why in a second, and I'm sending the output of that track to a different output of my rig. Which is fed to the input of the side-chain of this compressor. Since this is advanced vocal compression I'm assuming you know what a side-chain input is for a compressor. You go refer to that video please and come back our way. Now. I have my vocal, I have duplicated my vocal, which I'm sending to the side-chain. I'm gonna hit external side-chain here. So now, the compressor is no longer listening to it's input to figure out what to do. It's listening to an external input and that external input, I have control over. I'm gonna zero the bottom channel and just work with the top to keep it simple. OK? I'm gonna still use the limiter. Now I'm gonna set up my side-chain. I'm gonna hit external side-chain and then I'm gonna listen to my side-chain. And that is this signal EQed the way I want. So, I don't need to listen to the bottom because I'm interested in the Ss. I'll just push exactly where the Ss are gonna be. That's obnoxious, that should do it. So what am I hearing? I'm hearing what I'm sending the compressor and telling the compressor: "Yo, that's what I don't like." Than I'm removing the side-chain monitor. I'm now listening to just to what the compressor is doing to my regular signal while listening to this awful side-chain I just sent it. You can see it right here. Right? Without. I can do a little more, actually. It's so fast and so transparent I can actually take 10 dB of the Ss and you don't hear the problem. Let's listen to the next phrase which is insane. Without. If you think it's a little too fast, or a little too obnoxious or discernible, you just go to manual mode and slow it down a little. And it's so fast and so transparent that you don't hear the rest. So that, essentially, is a way to turn your compressor into a de-esser without having to sweat too much. In real life, you probably will have to de-ess before you compress. Which means you're gonna need a lot of gear. Isn't that wonderful? Or a lot of plug-ins, which is also wonderful. However, I don't think that patience is a problem because you decided to make music for a living so you have plenty of that. What are the double connections of the Dangerous (to use the two channels in dual from the mono)? Directly Left out to Right in? Or 2 separate inserts? Excellent! However, contrary to what Fab said, I believe that the volume of Dangerous was a little stronger than that of DSUs. We still feel superior clarity of Harware side (at least in video, so mp3). But that does not change the lesson. ............................. Excellent ! Toutefois, contrairement à ce que dit Fab, je crois que le volume de Dangerous était un peu plus fort que celui des UAD. On sent tout de même une clarté supérieure du côté Harware (du moins en vidéo, donc mp3). Mais ça ne change rien à la leçon. Both methods work great for me! And Fab is right...the Dangerous Comp IS pretty magical, if you can bite the bullet and get it. Never tried the dbx160 on vox...interesting. Thank you Fab. Actually it works great for me with the Dbx160, but now I'm going to try various pairs. The dangerous comp seems really awesome. @davpla: it's a question of taste if you like the DBX160 better go for it. I enjoy being able to adjust attack and release sometimes so 1176 works for me. The smart dyn circuit of the Dangerous comp has pretty much let me forget about attacka dn release ont hat comp. Unless I'm struggling with something particularly adverse. It's pretty magical. An idea: why not using a dbx160 instead of the 1176? Still for catching the peaks, but in a more transparent maner. Maybe the result would be somewhere between the two ways Fab demonstrated??? Also I have a question When you've done it with the 2 dangerous The 2 dangerous comps have pretty much the same settings ( attack and release parameters). Fab why havent you put a fast attack on the first comp? Hi I've used the technique with the two compressors, the peak limiter (1176LN) and the "color & texture" (LA-2A), it's great! Thanks Fab!